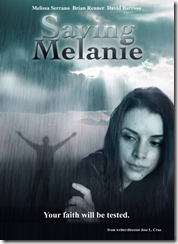 Saving Melanie, a Christian drama, is now available on DVD. The message of this film is forgiveness, trust, and testing. Most Christian films end with someone being saved, but this one takes the story from the salvation. It shows that just because you are saved that everything does not magically become perfect. The story of this movie is touching, but the story behind the scenes is inspirational. A young single mom, Melanie (Melissa Serrano), is excited about accepting Christ as her Savior. She is very eager to go out and evangelize everyone she meets. Her angry and alcoholic neighbor, Jonathon (Brian Renner), becomes her target. He tells her that she is not ready because she has not passed the “Job test”. However; he seems to be in the middle of his own “Job test” and is failing. When Melanie’s ex-boyfriend shows up, her faith will be tested intensely. She also learns that God can use the bad choices and situations from our past to help others. 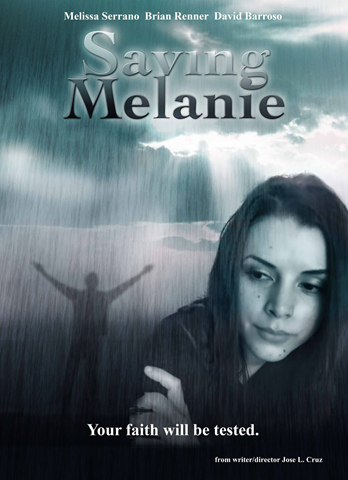 Saving Melanie is the first Christian feature film for producer Jose L. Cruz. He has made several short films in the past before he became a Christian. After watching The Passion of the Christ, Cruz decided to accept Christ and make Christian movies that would touch others like that film touched him. He was also inspired by Sherwood Church (Flywheel, Facing the Giants, and Fireproof). The story of Saving Melanie came about from a conversation Cruz had with his pastor about why people leave their faith. The first draft of the film was written in just a couple of weeks. At that time he did not realize that his own faith would be tested. He would go through a divorce, depression, and was at risk of losing his faith. After many prayers, he felt the answer was to proceed with the film and stay strong in his faith. As the characters in the film went through their tests and overcame them, so would the life of the producer. Cruz says, “The film was his spiritual therapy.” He is looking forward to making more Christian features.